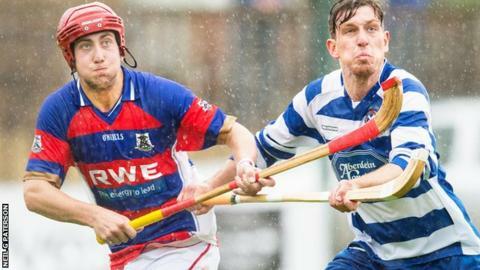 Shinty giants Kingussie face a rather different challenge on Saturday when they try to avoid relegation from the Premiership in a play-off against National Division runners-up Kilmallie. It's an unimaginable scenario for a club that's dominated the modern game and only last year lifted the showpiece trophy, the Camanachd Cup. However, those glory-laden years seem rather distant now, with manager Davie Anderson admitting it's a situation that's been on the horizon. "We always thought that we were kind of invincible in Kingussie," he told BBC Scotland. "We'd seen it happen to Newtonmore, the great team of the 70's and 80's. We thought we'd never let it happen. But there's not a lot you can do about it. "You're picking a team out of a community and we've got a huge age-gap difference. "Four or five guys with plenty of experience and we just don't have guys between 20 and 30. We are where we are unfortunately. "It's been coming for three or four years. We've lost a number of experienced players. "Everybody will point the finger that we may have held on to players for too long and that's probably true to a point." There will be no return for Kingussie legend Ronald Ross, who last featured for the side in that Camanachd Cup win last season. Ross, scorer of a record 1,000-plus goals, suggested he would come out of retirement if required, but Anderson is adamant that the club have to go with the squad they have. "We've really got to look at playing at the level we are, which is the young guys coming through," he said. "Hopefully they can do it on their own. If they manage to survive, well we're good enough, if we're not then we'll go to the National League and try to rebuild and come back stronger and better for it. "It's definitely as big a game as the Camanachd Cup final was for us a couple of seasons ago. "None of us have been involved in anything like this before, so it's a strange feeling." Kilmallie go into the play-off high in confidence but perhaps burdened by having not played a competitive fixture in 10 weeks. Despite that, coach Mark MacPherson believes his side can win and gain promotion. "We got to the Camanachd Cup final in 2005 and I'm classing this as big as that," he said. "Training has been really intense. "The way it's going to work is some of this game will be on adrenalin alone. "We're never going to be match fit, but I'm still confident. The boys have put a lot of work into this. "We'll have to play our best game of shinty this season to win this game. "We're more than capable of going and beating Kingussie on Saturday." Kilmallie were unfortunate to miss out on promotion in 2013 as a result of league restructuring. MacPherson believes his squad is progressing quickly and, if it goes against them in the play-off, they will be odds-on for promotion next season, something he sees as vital for their future. "Absolutely massive just to get the young fellas involved," he said. "You've got to be in the big league. "You lose a lot of young players to Fort William, who're in the Premier League. "Whatever happens, if it doesn't go our way, we'll be well and truly ready for the Premier League after next season. "We'll be favourites to win the National Division next year. "We are a big club. People say Kilmallie are sleeping giants. "This Saturday, we've got to wake up and have no regrets at the end of the game."